I watched the webinars on phone banking and block walking. For the former you log onto an automatic dialer and speak from a prewritten script. Block walking is based on the same principle: instead of phone numbers the system identifies voters’ streets and houses from a smartphone GPS. The script is the same: get voters to commit. “Will I see you in Dallas?” I ask the volunteer. At Logan Airport I watch the Jet Blues line up and taxi, top lights blinking in the sunless afternoon. It’s all New England, cloudy, chilly, ready to rain. A mental goodbye to home. Dallas will be in the nineties. I don’t know what’s in store. All I know is the address of the Dallas headquarters and my plan to walk in and introduce myself. My phone rings. Its another Beto volunteer. How am I? Where am I? Is everything okay? I’m relieved that people are taking the time to reassure me that all is well. I tell him I’ve watched the webinars, that I have a smart phone and computer but would still need a little help. No problem. I begin to rest easy. He says to show up tomorrow at the headquarters. Dallas is all sprawl. Fast food joints abound, Chick-fil-A, Whataburger, Taco Bueno, a Spanish chain supermarket called La Michoacana. My Lyft driver is an Iranian named Mashid. We have a softball conversation about immigrants coming here for a better life, my grandparents, his grandparents, all the same, all good. We speed through a maze of highways and beltways and swirling roads above our heads, all concrete and red steel. There’s no feeling of a center. We’re not in Kansas any more, but I don’t say this to Mashid. We talk football, Vermont, snow and seasons. Does it snow in Dallas? Hardly and when it does, watch out. At the end of the ride I channel Polonius. When trying to find out about his son, Laertes, then in Paris, he instructs his spy to “take as it were some distant knowledge of him.” I tell Mashid that I’ve read about a race for Senate between someone called Beto O’Rourke and Ted Cruz. My motel is on a four-lane in a part of southwest Dallas called Duncanville. In the morning my phone dings with a text. Come to the headquarters at ten. I pack phone and laptop into my L.L. Bean shoulder bag and mentally review the webinar on phone banking. I grab a Lyft to the headquarters where a Texas-sized Beto sign dominates the frontage of a partly occupied mall. I enter an outer room with receptionists selling Beto shirts and lawn signs. I pass into the main room, full of chairs and trestle tables, couches and sofas occupied by volunteers glued to their screens, some in positions of attention, some in semi-repose, some napping. Their computers are decorated with Beto stickers. I make a rough count of thirty odd, men and women in equal number. Dress is casual, unimportant. 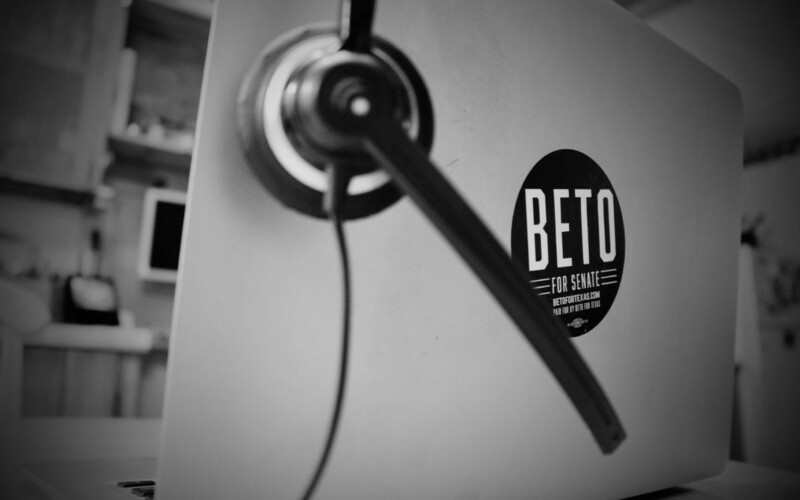 Many wear Beto tee shirts – twenty-five dollars and not free to anyone. Volunteers are glued to their devices, lounging on couches with computers on their knees or phones in hand. A few dogs sleep under the trestle tables. I introduce myself to a volunteer who is impressed and thankful that I’ve come all the way from Vermont. Why are you doing this? she asks. I give the answer I will repeat to others in the days to come. Vermont is solid blue and Beto has a chance to flip the Senate. Maybe I can make some small difference. I reveal a secret that I don’t often share: that after getting interested in the Beto campaign I found his online statement of why he was running. He and I share the same favorite book, The Odyssey. The phone bank room consists of twenty odd desks, and the walls have signs in red and green marker with URLS and passwords necessary to log onto the automatic dialer. At the front of the room are stacks of laptops for volunteers and printed scripts to follow when speaking to a voter. I practice the script verbally with another volunteer, then log onto the dialer. I watch the screen and listen for a ‘ding.’ This means the voter has already been called and has said hello. I jump right in. Hi, I’m a volunteer with the Beto O’Rourke campaign and I’m calling for Voter. Is this Voter speaking? I’m calling to ask if you will vote for Beto in the November election. Can we count on your vote? Simultaneously with this conversation a data box on the screen lists the voter’s name, age, address, voting record from 2016, polling place location and the early voting schedule. Early voting is encouraged. All this is public record, information the phone banker tries to leverage into a solid commitment by having the voter visualize the act of voting. On a scale of one to ten, will you definitely vote? If you plan to early vote, do you know that you can vote anywhere in the county? You can also vote at your designated voting place. On what exact day will you vote? At what time of day? Do you have your photo ID? Can you get to the polls? Would you like an email reminder? And finally, if by now the voter is willing to keep talking, we point out that who you vote for is a secret, but whether you voted is public record. Can the voter share an email address so we can follow up after the election to review the voting experience? This is designed to be the final lock, but in all my hours of phone banking I’ve only reached this point once or twice. Most voters have been called more than once, and even if they’re Beto supporters patience wears thin and they want to end the call. The results of every call are recorded on a dropdown menu: Strong Beto, Lean Beto, Strong Cruz, Lean Cruz, Undecided, Has a plan to vote, Has no plan to vote, Wrong number, and Spanish speaker, of which there are many: they will be called back by a Spanish speaking volunteer. Many of the voters hang up as soon as they hear your voice. They will be called again. With the exception of an afternoon of block walking I phone bank every day, nine to five or six, sometimes later if I have the energy and if my voice holds out. The headquarters are open from nine to nine and volunteers of all ages and colors come and go, some for just a few hours, all of them wanting to do something to help, all feeling the urgency of this election. I train the new phone bankers by enacting the script. I’m told that my lack of Texas twang is not a drawback. My impression is that women Beto voters seem more motivated, not only to vote, but to get other women and family members to vote. Those Cruz supporters who have slipped through the cracks are sometimes polite, but more often staunch Republicans with an angry edge, insulting Beto personally, or repeating the playbook mantra that Beto stands for open borders, abortions, free medical, free college, higher taxes, and and sanctuary cities – the last of which Beto does support. To a burst of profanity from a Cruz supporter I simply say, “Have a nice day,” and put him on the drop down. Then I take a few deep breaths. To a woman voter who says she’s organizing all the women in her apartment building to vote for Beto, I feel like what I’m doing has some value. By the end of my stay I’m ragged, hoarse voiced, and realize that everyone in the headquarters works with such focus that I’ve had no more than one or two minute conversations with other volunteers, mostly along the lines of how much I’m appreciated. I sense no rigid structure in the organization, no personality conflicts. Everyone supports everyone else and things get done in a process of disorder and order. During my stay the campaign has begun to open small “pop up” offices through out the state to accommodate more volunteers in the last days of the campaign. These are donated spaces in homes or stores in locations convenient for new volunteers to work from. Block walkers will be paid. With the election imminent, Beto and Cruz have debated twice and Beto has had a CNN Town Hall which Cruz didn’t attend. Conventional wisdom says that little or nothing has changed The polls still show Beto single digits behind. To win he will have to find voters in a state with a low voter turnout percentage. There’s no way to project an outcome even though The Houston Chronicle, the state’s second largest newspaper and a traditional Republican supporter, has endorsed Beto with a stinging rebuke of Cruz as an absentee more interested in his own career than the welfare of Texans. I’ve met volunteers who have left their jobs to join the campaign. I’ve seen how deeply all are invested and I wonder about their reaction when it’s over. When the votes are counted we’ll see either grief or elation, but I can’t believe that it’s winner take all. Whatever the results, a movement has been set in motion. The energy of those committed volunteers will not be lost. On my last day I sit in a restaurant in my Beto tee shirt, A woman gives me a thumbs up.